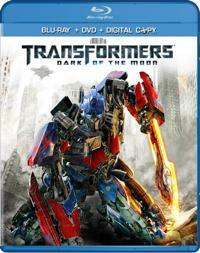 Win 'Transformers: Dark of the Moon' on Blu-ray! Say what you will about Michael Bay’s movies (we sure have), but they always make for nice home theater eye- and ear-candy. Now you have the chance to win the director’s latest robot slugfest. 'Transformers: Dark of the Moon,' on Blu-ray! If you were a Transformer, what would your robot name be and what would you transform into? Extra details such as what allegiance you’d be (Autobot or Decepticon) are also welcome, along with any other story details you can come up with. However, please note that the names and descriptions cannot be based on any already-existing Transformer character or toy. These have to be original ideas. For example, Josh Zyber's name would be Spin Doctor. He would transform into a helicopter (hence the "spin"), and he would be the Decepticons’ Director of Propaganda and Public Relations. Because frankly, if the Decepticons really want to take over the planet, they need someone to help them win the hearts and minds of the native populace, to make the pathetic humans believe that being conquered by evil robots from outer space would actually be a good thing. The lack of such a specialist has clearly been a major failing of their strategy thus far. The two cleverest, funniest, or just plain most interesting entries, as selected at our own subjective discretion, will each win one copy of ‘Transformers: Dark of the Moon’ on Blu-ray. Entries are limited to 10 per person. That should give you plenty of opportunity to craft a good submission, but will also help us to avoid any potential appearance of awarding prizes based on volume rather than quality. The deadline for entry is tomorrow October 7th. The winners will be announced next week. So what are you waiting for? Get on over to The Bonus View and enter to win! !